The thermometer shows -35 °. The snow on the ground is only the continuation of the white and seamless sky, enveloping the Kazakh steppe in the winter. Against this background, the Catholic Cathedral of the Assumption, with its red brick, stands out even more. A little farther on, the largest mosque in Central Asia, a Russian Orthodox church, the Protestant, Buddhist, but also the Pyramid of Peace, by star architect Norman Foster, symbolizes the union of all religions. Astana, capital of Kazakhstan, fully embodies the ideal of pax religiosa wanted by President Nursultan Nazarbayev at the base of his policy, to guarantee social stability in a country, home to more than 120 nationalities and 40 different denominational groups. Catholics are only 2% out of 16 million people, a mostly Muslim majority. 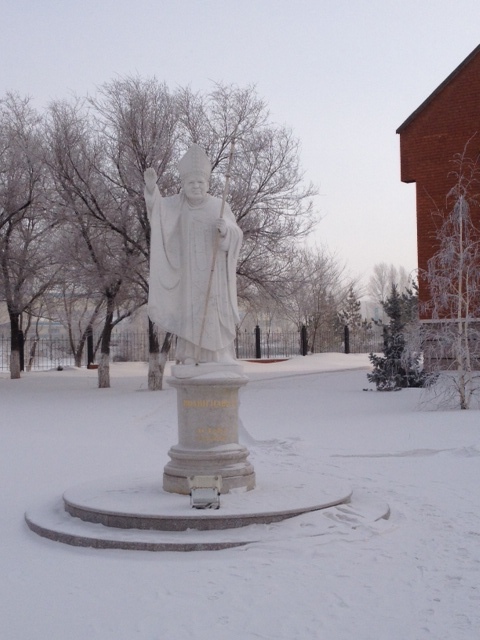 "A little flock, of which it is difficult even to map the exact number of the faithful, but that Christmas makes stronger and more united," as AsiaNews is told by Father Roland Jaquenoud, vicar general of the Archdiocese of Mary Most Holy in Astana. The diocese is "young", elevated to an apostolic administration in 2003 by Pope John Paul II, whose visit is commemorated by a statue, placed in the garden of the cathedral. Swiss-born, Fr. Roland has been in Astana for three years. "In addition to the cathedral - says the priest - there's another Catholic Church, Mary the Mother of all nations". It is located in a poor neighborhood and was the first church in the city, which was granted in 1979 by the Soviet regime to the local community, when the Astana with skyscrapers and shopping malls of today were not even in the plans of Nazarbayev. In fact it was Nazarbayev who, at the end of 90s, wanting to move the capital from Almaty, transforming the old Akmola ("white cemetery" in Kazakh) into what is now the administrative center of the new independent nation of Kazakhstan. But the fact that there was a church at the time of the USSR did not automatically mean that there were also priests. "And so, after decades of faith lived in silence and in secret, the Catholics of Astana are now used to a modest and simple Christmas" says Fr. Roland. For the Vigil, the Cathedral of the Assumption (curia and parish at the same time) was full of people, even if the next day, December 25, was a normal working day here. But the church is not full all year round. "Catholics actually practicing in the city, are about 500, but Easter and Christmas celebrations also attract many Orthodox and Muslims, interested to see how it is celebrated." "Many here believe that Catholicism is a cult - the clergyman adds - All people know about the Pope John Paul II in particular. For most of the population Christmas is the Orthodox one that falls on Jan. 7, according to the Julian calendar." Driven, however, by a real research and not just from sheer curiosity, there are many who come to the cathedral to pray or simply to confide in someone. Father Roland tells of "a Kazakh couple who every Sunday at 8 come to light a candle, read the Bible and then leave in silence". Others, however, have begun a real journey of faith. "Conversion from Islam is permitted and there are several, but they are mostly non-practicing Muslims, - he underlines - There are always difficulties related to the family, which, however, often accepts and supports the choice." A "moving" case was recently, one of three women: a mother, her daughter and her grandmother, whose husband was an imam, who was imprisoned during the Soviet period because of his faith. "When the young woman confessed she was no longer at ease with Islam, her mother and grandmother did not condemn her, but they only told her not to leave God and to find the right faith for her - recalls Fr. Roland - It actually was her grandmother who gave her the first Gospel and after a long journey, she decided to be baptized". The initial great tolerance of the Kazakh authorities has, however, been gradually decreasing. For fear of the proliferation of Islamic fundamentalist sects - as the government officially explains - a law widely criticized by human rights defenders was launched last year restricting the entry of foreign preachers in the country, imposing strict rules for the registration of religious communities. "I do not think it will solve the problem of extremism," said the vicar, who then admits that things are "a little 'complicated" for the Catholic Church, with long waits for visas and complex paperwork. "But these things are common to all foreigners and there is nothing against the Catholic Church in particular," he adds. Indeed. The Sisters of Mother Teresa, for example, are obviously loved by all. "In all, Astana, there are four of them and they work with the poor and homeless," says the priest, for whom the missionaries are doing "fundamental" work. "If I have a problem in the social sphere, I know that I can call them, because they know the needs of the community very well." And one of the biggest problems after alcoholism, is that of abortion and the family in general. "We started with meetings with women who wanted to abandon their children after birth because maybe they were born from extramarital affairs, and we recently started a sort of clinic, where there's a lot of women, especially Muslims."